Solar Power – how it works! SSS offers the supply and installation of solar systems for residential or commercial customers. We assure you that you will get your solar panel system designed and built following best-industry-practices. This is ensured by using our in-house CEC accredited installers which makes sure that we have full quality control by not subcontracting work out. 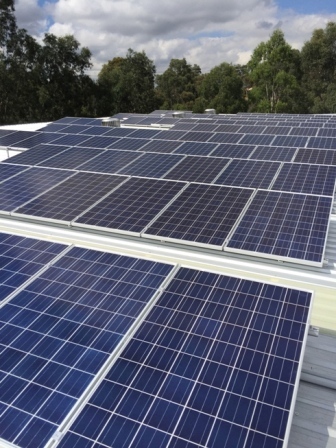 Our installers are trained beyond industry standards, being certified by the Australian Solar Council to comply with the Solar Gold Standard. They are remaining current on best practices through Clean Energy Council and Solar Council memberships. In addition to our high focus on the quality of workmanship, we only use Tier 1 modules and inverters that have a proven track record of reliability and other quality electrical componentry that ensure safe operation during the whole 30 and more year lifetime of your system. We only use new and CEC approved components to ensure your eligibility for the Australian government’s solar rebate scheme. We have access to a range of products to ensure that your requirements are met. Ask us about special offerings at the moment. Due to our bulk orders we are able to offer our high quality solar components at better prices than others. 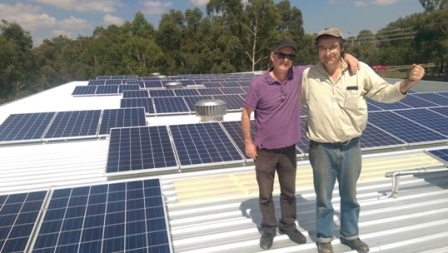 We want to increase deployment of solar panel systems in Australia. For this we have tailored a product which frees you from the burdens of buying a solar system. You will not need to worry about financing the solar system, its quality, performance or its maintenance. By qualifying for our commercial Solar Sponsoring your company may be eligible to receive your commercial solar system financed, installed, maintained and insured by us. You will receive the energy it produces from SSS at a rate below what you currently pay to your retailer over a period of 10 to 15 years after which the system is yours. This allows you to save money from day 1 without any investment or operating expenses, just watch your roof turn into a productive asset. Take advantage of the benefits of solar panels for your business operations without the need to spend time on managing the process of getting a solar system. We guarantee to provide a top quality system, as it is in our best interest that the system performs perfectly in order to be able to sell the maximum amount of electricity. Should the system underperform, that becomes our problem, you simply buy the electricity from your normal retailer as you normally would. 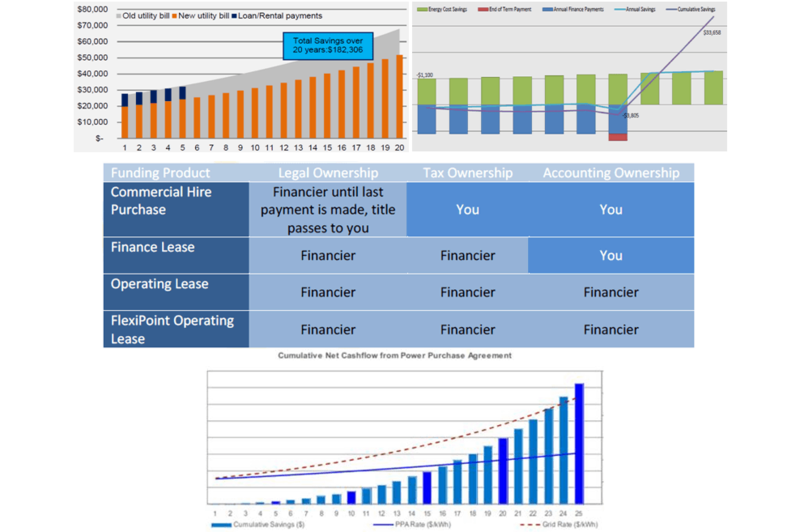 Using Solar Sponsoring to finance a solar system means that no negative cash flow is ever generated for you since you only pay for what electricity you consume and do not have to invest anything in the solar system… ever! Additionally your company gains instant benefits in reputation with employees, collaborators and clients. Contributing to reductions in greenhouse gas emissions also improves the company’s sustainability. All of this is achieved without any financial or technical risks normally associated with the installation of commercial PV systems. If you want the benefits of solar panels, give us a call or a quick email to see whether your operation may be eligible to receive a sponsored solar system from us and take advantage of this well established business concept. It only takes a minute and your company will appreciate your personal initiative towards less costs and a greener footprint. In case your company is not eligible for commercial Solar Sponsoring or you’re a residential customer, consider the benefits of solar energy by leasing. With residential and commercial Solar Leasing we can offer a product that can provide you with a cash flow positive asset which pays for itself. You receive a solar system by us without any upfront cost and the savings yielded by the system can outweigh the finance payments on an annual base. SSS would still arrange for finance of the solar system for you. The better financing rates we can access will be passed on to you through monthly lease payments that may be below what the solar system saves you in cost. The savings you achieve with your solar panels will instantly reduce your energy bill and could possibly overcompensate for the lease payments. Furthermore, all the solar energy you do not use can be sold into the grid. We operate mainly in Victoria, Australia and focus on Melbourne Metropolitan area. As Registered Builder specializing in Commercial Solar Panel Projects & Solar Leasing we can support your Company Solar System Projects with Zero-down options with positive cash flow from day 1 for all sizes of Business Solar Panel Installations.